It is with a great deal of sorrow that I inform all members of the passing of Terry O'Connell. Terry passed away on Saturday from cancer. Sincere condolances go to all of Terry's family. Member number 149, the salt bug bit deep for Terry. Attending DLRA events since 1998, in his black Mailine ute his wife, Liz by his side. 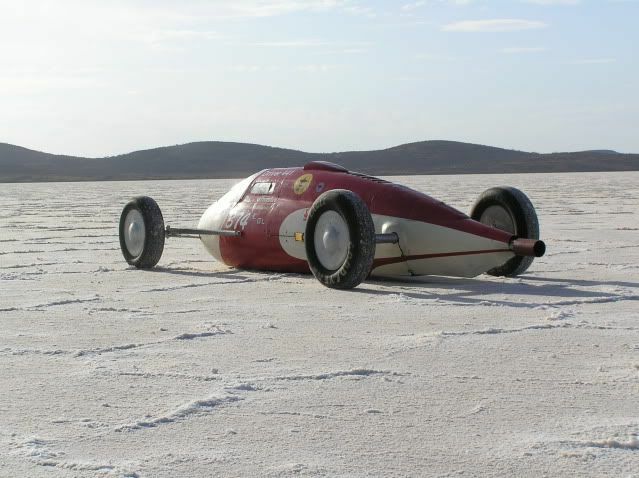 He then built what has to be one of the most beautiful lakesters to ever race at Lake Gairdner, but unfortunately he would never get the chance to drive it due to his failing eye sight. Those that did included Des Jewis (2006, 2009, 2010), Terry's son Nat (2010) and of course Animal who managed to set 2 class records in the car (2009-201.274MPH, 2010-212.854MPH). 2011 Speed Week was going to be Terry's swansong and Animal did his very best to ensure Terry and the car made it, making several trips to Adelaide to prepare the car. As everyone knows Mother Nature played it's part and we never got the chance. Terry was the original quiet achiver and loved nothing more than tinkering on the car out in the garage. He lived the dream. To a casual observer Terry was a grumpy old barstard but he had a heart of gold and a wicked sense of humour who did not suffer fools lightly. His presence around the pits on the salt will be missed very much. Godspeed Terry, you built a 200mph car, congratulations and farewell. RIP, Terry. My condolences to the family. Pete . Always a nice blke to chat to. Condolences to his family. I didn't ever meet Terry but I did get the opportunity to see his lakester at Speedweek 2009. It is a work of art and something Terry would rightly have been proud of. Not only was it a clever design but it was clearly built with a craftsman's attention to detail and a passion for doing the job properly. That is Terry's legacy for us all, a car to be admired in years to come that will inspire others to build cars of a similar quality. Thanks Terry. My condolences to Terry's family. I had the pleasure of Terry's company with Animal at the table of knowledge this year and he will be sadly missed.